Now known more for poetically barking orders from the bench in his role as Head Coach, Kevin Parrish has been a key figure in Dynamos history both on and off the ice. Parrish was a part of the very first Mos side in 1997 and now, some 20 years on, still has the club running through his veins as he masterminds the team’s fortunes as the man in charge. As a player Parrish featured 210 times for the Dynamos and tallied 35 goals and 69 assists for a total of 104 points and as a coach he has held the reigns for over a decade having taken over from predecessor Phil Chard in 2004/05. Under his leadership the team secured six consecutive league championships between 2004 and 2010 whilst also scooping numerous cup and playoff titles but he has an insatiable thirst for more and continues to push to bring more silverware to Kent each season. 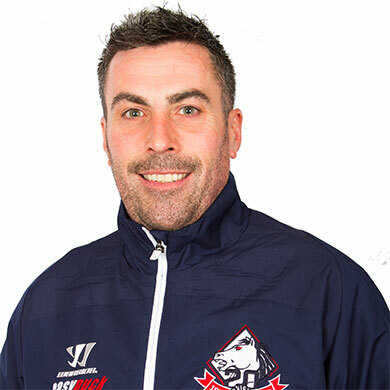 Having played for and then coached the Dynamos from year one, Parrish has without doubt been a part of more Mos games than any other player or staff member.